A manufacturer of custom precision optical components and systems since 1988, Midwest Optical Systems (MidOpt) is the world’s leading resource for off-the-shelf and custom machine vision filters, lenses and accessories used in industrial imaging applications. MidOpt has an extensive history in optical component design, fabrication and inspection, and continues to develop innovative new products for industrial vision and CCTV end users. 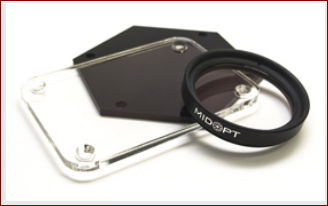 Specially designed for industrial imaging, MidOpt Bandpass Filters are the simplest, quickest and most cost-effective way to improve the image contrast, repeatability, and long term stability of any industrial vision system. A bandpass filter transmits a specific portion of the spectrum while blocking shorter and longer wavelengths. Increasing signal-to-noise results in improved contrast and better control over changes that may occur over time in ambient lighting conditions. In the case of bandpass filters, “broad” and “rugged” are necessary in most machine vision applications. This allows for use with wide angle lenses and for variations in the spectral output of LEDs and laser diodes, while providing environmental stability and mechanical durability. 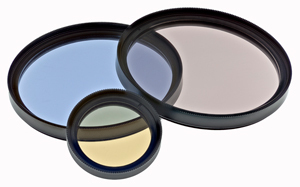 Dual Bandpass Filters are ideal for applications that use a color camera during the day and IR illumination at night – ensuring that clear, accurate images are acquired under all lighting conditions. A dual bandpass filter transmits two specific wavelength ranges while blocking shorter and longer wavelengths as well as some middle portion of the spectrum. While triple bandwidth transmits three specific wavelengths ranges. These filters in particular pass visible light and some smaller portion of the near-infrared spectrum. Blocking most of the near infrared allows for excellent color rendition while retaining the ability to pass a specific LED or laser diode wavelength used for night time illumination. Most commonly used for security and surveillance, intelligent traffic solutions and Normalized Difference Vegetation Index (NDVI) imaging. These filters pass visible light and a narrow IR band that make viewing with commensurate IR illumination possible at night. Dual Bandpass Filters are becoming increasingly popular in NDVI aerial drone inspection, allowing for single sensor imaging and reduced operation payload. NDVI, traditionally achieved by satellite imagery, can now be obtained utilizing Dual Bandpass Filters and personal aerial imaging devices. Longpass filters transmit wavelengths longer than the specified cut-on wavelength while blocking shorter wavelengths. They are usually used in monochromatic applications to improve contrast, where like colors will lighten like colors. 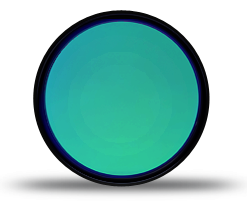 Most MidOpt longpass filters are absorptive rather than dichroic (reflective), making them well suited for wide angle applications. Shortpass filters transmit wavelengths shorter than the specified cut-off wavelength while blocking longer wavelengths. Perhaps the best example of this is the infrared blocking filter that is typically found in a color camera. In order to achieve accurate color rendition, this filter blocks longer wavelength infrared light and passes shorter wavelength visible light. Several Shortpass filter types are offered which block varying amounts of visible and near-infrared light above and below 700nm. 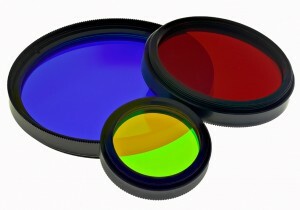 The choice of the best filter for any application is often based on the spectral characteristics of the camera sensor. Serves as “sunglasses” for your system and can be used with monochrome or color cameras. Designed to reduce light intensity neutrally over a specific wavelength range without affecting image color or contrast. 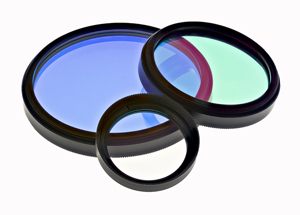 Neutral density filters reduce transmission uniformly over a specific portion of the spectrum. They are defined according to their Optical Density (OD). The higher the OD, the lower the transmission. These filters can be stacked to create filters with custom ODs. They are useful when trying to image extremely bright subjects or when trying to provide separation of subject matter from background by reducing depth of field. 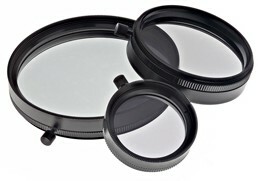 Ni filters are unique in maintaining exceptional spectral neutrality over the full visible-to-near-IR range while greatly limiting undesirable back reflections over that same range. Applications include imaging in intense lighting situations (i.e. molten metal and welding), outdoor aerial imaging and photography. 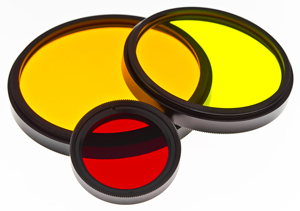 Neutral Density Filters help reduce shutter speed to create blur, preventing a “jello” effect in aerial imaging. 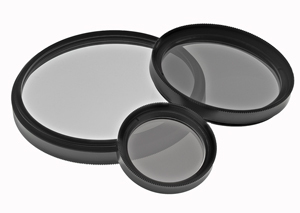 Protective Filters typically act as windows or dust covers for lenses, filters, sensors, cameras or lighting. Usually they will block a portion of the UV spectrum, although those used in infrared applications will often also block visible wavelengths. Block UV wavelengths while simultaneously passing ≥90% of the visible and near-IR. Available in mounts or custom sizes up to 600mm (24”) dia. ; can be provided with through-holes, tabs, or other features to aid in mounting. LP280 and LP330 will pass near-UV light, while other types block UV. Other materials not listed here are also available, please contact us with your specific requirements. AC685, AC700 and AC760 acrylic materials are 2mm thick, shatter-resistant, and appear black; blocking visible light and passing near-IR wavelengths. Other listed materials pass visible light as well as the near-IR. Also available are materials that are not shown here. Please contact us if you have other special needs. 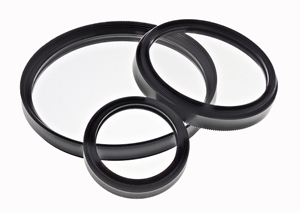 Acrylic Longpass Filters are frequently used for lens protection and economical enclosure windows, as well as over light sources to control the wavelength emission of broad spectrum light sources. Because of their durability, they’re commonly used in Food & Drug Administration (FDA) and European Food Safety Authority (EFSA) regulated applications where glass over the inspection area is not permitted. AC370 and AC380 offer anti-abrasion, anti-reflection coating, which can also withstand harsh solvents such as alcohol, acetone or MEK. Light Balancing Filters correct artificial lighting so colors appear more natural. These filters balance color, preventing the need for additional software processing. This allows for greater image stability and control. Light Balancing Filters are used to modify the color balance in LED, fluorescent, halogen, metal halide, tungsten, and other white lighting, making colors appear more natural. The LA series (Minus Blue) reduce blue shading that often strongly predominates in white LED and xenon strobe lighting. The LB series (Minus Red) reduces the red hue found with some tungsten and halogen lighting. Commonly used in color applications (i.e. machine vision/factory automation, photography, and fluorescence imaging).